Sibylle Peretti's dreamlike and enigmatic imagery immediately pulls the viewer into another world - a place where diseased or feral children are healed by a rare and spiritual connection with nature. 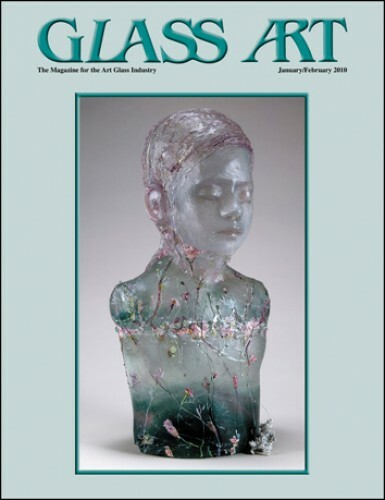 In this conversation with "Glass Art" magazine, Peretti discusses her latest body of work, a skillful combination of engraving, photography, painting and glass casting that exposes exquisitely subtle environments we wish to enter in spite of some uneasiness. Tapping into the unlimited amount of online tools for both marketing and sales can make your business work for you during your off hours. Many online resources, such as blogging, are available for your business at no cost - and they can offer great results. Ann Sanborn reports. At the conclusion of Butch Young's last article, she thought she had a pretty good handle on the Phyllis Madonna residence window project. But she couldn't have been more wrong. Learn about the unique challenges presented by these cast glass panels and how this sandblaster tackled the project. Milon Townsend develops and creates an artwork for a birthing center in Austin, Texas. The frame around the piece contains LED lighting that illuminates the artwork from the sides. 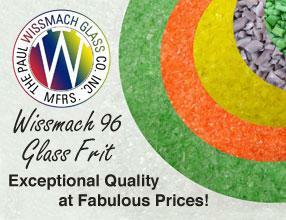 Mylarr reflective plastic was used as a backing material to bring out the colors in the frit background. A welded steel frame was attached to the reverse side of the artwork, making it simple to install. The 2007, 2008 and 2009 Glass Art Society conferences, held in Pittsburgh, Portland and Corning respectively, featured panel discussions on how to make glass art more sustainable. Eddie Bernard, owner of Wet Dog Glass LLC, Star, North Carolina, played a vital role as organizer and/or panel member at all three events. Find out what Bernard is doing in conjunction with STARworks to reduce carbon emissions and make the glass studio more environmentally friendly. Blasting artist Peggy Dee dissects her process and showcases some of the techniques used to create a large, multi-dimensional commercial project. She discusses how to achieve eyes that are deep and emotional, the importance of negative space to a composition, tips and tricks for blasting expressive faces, and how to achieve the perfect lace.